According to the financial director of Kofola, the company commands about an 11% market share in the production of soft drinks in this country. In Slovakia, where Kofola entered just a year ago, it already controls half of the market. The firm is currently expanding to Poland. Chairman of the board of Generali Pojišťovna announced the take-over of the Zürich insurance company. During the first quarter of 2003, Generali signed non-life insurance contracts worth CZK 977 million. The chief of the mobile field hospital in Iraqian Basra can be satisfied. The hospital’s care is highly appreciated by both military officials and common Iraqi people alike. Even the local chief, sheik Chaláf Munsúd, expressed his thanks to the doctors. The ex-minister for local development paid millions of crowns from the state budget to private firm DaDa for work that should have been done by his employees. He bought promotional CDs about the Czech regions – for CZK 60,000 each – but due to errors these CDs cannot be used in practice, so the money was wasted. The Municipal Court in Prague 1 declared bankruptcy proceedings against the meat industry entrepreneur and former chairman of the Czech-Moravian Soccer Union. He is suspected of fraud worth hundreds of millions of crowns and faces12 years in prison. The former owner of the Vsetín hockey club and firms involved in the oil industry is charged with extensive criminal activity. 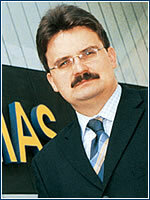 He allegedly caused damage against Union banka and Moravia banka worth almost one billion crowns. He faces up to 12 years in prison. NINE YEARS AGO this forty-three year-old Londoner decided to give up her highly specialized work as a brand manager in British fashion retail and jump at an exciting opportunity to establish herself in the nascent central European market economy. First, as the managing director of the retail division of Flow East, she was in charge of the Melissa and Blue Praha shops, and later she got the chance to leap into the entrepreneurial elite. Under the aegis of Flow East, she created the famous Body Basics brand, whose cosmetics and accessories designed for body care acquired many fans in the Czech Republic, Poland, and Serbia. Pollitt took advantage of the desire for western cosmetics that in the mid-90s was generated by newly published fashion magazines. She created the entire product line (which currently includes 1,000 items), located suppliers, and oversaw everything from production to final sales. She has no regrets about giving up the vibrant city on the Thames for one on the Vltava. “In England you can’t find such an exciting job. Everything is broken down into divisions, and you don’t get the chance to follow an idea from beginning to end,” she explains. Last December the firm’s ownership changed. Flow East was replaced by a consortium of three British investors – New Merchant Adventures, Invest East, and Fision Retail. In the latter firm Pollitt figures as partner, as well as in PR agency Fision Group, where she also holds the post of managing director. While Body Basics’ sales reached EUR 3 million last year, the ambitious Pollitt has many improvements in the works, such as new product launches and new retail environments. TOMÁŠ PALIČKA (32), the new general director of Village Cinemas Czech Republic, is a specialist in merciless competitive battles. “I am drawn to business because it’s tough, but also fair,” says Palička, who prior to entering the entertainment world was working in the highly competitive sphere of gasoline stations. As the marketing manager of Shell Czech Republic he could, together with his colleagues, take a fair amount of credit for the fact that Shell became a leader in its field. At the head of Village Cinemas, he wants to fulfill the same goal in the multiplex cinema market. It won’t be easy. The great multiplex boom that started in the early ’90s led to merciless competition. “The Prague market is completely saturated,” says Palička, adding that the nine multiplexes, two of which belong to Village Cinemas CZ (in Černý Most and the Anděl City complex in Smíchov), outstrip the demand. His task now will be to find new strategies to ensure that the Czech branch of the Australian company Village Roadshow Ltd attracts the greatest number of viewers. How will he achieve this? “Apart from offering unique club halls for demanding Gold Class clients or Cinema Europa, we want to differentiate ourselves from the competition by offering the best film experience in Prague,” he says. The first attempt in this respect was a unique 24-hour non-stop screening of Matrix Reloaded, which one day before the official premiere drew 8,000 viewers in all the 14 cinema halls. The high quality of Smíchov’s multiplex has already been recognized by a panel at the international MAPIC trade fair of commercial real estate in Cannes, which awarded the facility the 2002 European Construction prize in the entertainment category. Palička, who is a passionate hockey player and collector of music from the ’80s, believes that this is just the start of a prosperous era. “If I didn’t believe that, I wouldn’t be here,” he remarks with conviction.